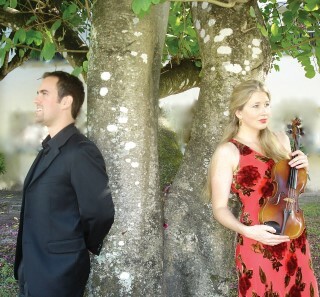 While in Maine on summer vacation, local favorites Daniel Strange and Ashley Liberty will present “Hot Fiddle!” - a concert featuring new music and new musical arrangements. The talented musicians are a dynamic husband and wife team known for their skilled performance of multiple genres including jazz, blues, swing and classical music. Liberty, an accomplished violinist, and Strange, a talented pianist, have accompanied numerous well known Broadway and classical performers including Norm Lewis, Sutton Foster, Andrea Bocelli, Noel Paul Stookey, and Bernadette Peters. “We’re excited about this concert because it’s a celebration of American music,” said Liberty. They have always played European classical music, mixing in some fiddling, jazz and even a little rock, she said; but for this show the focus is on American Folk music and Strange’s arrangements of composition. “We’ve added a few really new things that we’re excited about,” she said. One of the things they will premiere at the concert is a new arrangement of Billy Joel’s “Angry Young Man” said Strange. They’ll also do a little James Taylor, Vivaldi’s classical movement “Summer”, and a variety of other compositions. “Everything is centered around the theme of ‘Hot Fiddle’,” Strange said. The challenge then, is how to make “Hot Fiddle” be the focus while still doing something that people may know, or recognize, he said. Strange added that he always gets excited about doing a variety of music, but the themed show will really allow him to get into the music, and make it his own. “I think this is going to be one of the most versatile and virtuosic performances we’ve done as a duo in this community yet, and we get to do it for a full night,” he said. Liberty said they enjoy the intimacy between themselves and the audience that a smaller venue creates. They want to make the show a night where everyone feels included, through friendly banter and music that everyone can appreciate. “Familiarity is just a great thing, so if we’re out there playing a James Taylor tune, but we’re doing it in a unique way and presenting it with our own flair, everybody wins. The audience knows the tune, we’re having a great time, and Dan has created something brand new for us,” she said. Strange, who is a Windham High School graduate, and Liberty try to return to the area each summer. They also have performed for many years in the American Family Holiday Concerts put on by the Windham Chamber Singers. The couple recently celebrated their tenth wedding anniversary, and said something that makes this concert special, is that they are returning to the church they were married in. “It’s always a magical place to perform,” Strange said. “The church community, in particular, has been tremendously supportive of us,” Liberty said. Strange was the music minister at the North Windham Union Church for a year and a half before moving to Miami. The North Windham Union Church and the Raymond Village Church, where Strange’s mother attends, are co-hosting the concert. “It’s like the best of our church family, and our real family, who has their church family - everybody is connecting,” said Strange. “It’s a nice way for us to catch up with everybody,” Liberty said. Strange added it’s like scheduling a visit with everyone in one night. They can perform, and then come out and chat with people about their children or what they’ve been doing on vacation, he said. “It’s always a treat to come home and perform for everybody who has supported us for all these years. It’s amazing,” he said. “Hot Fiddle!” is scheduled for Saturday, July 15, 2017 at 7 p.m. at the North Windham Union Church at 723 Roosevelt Trail in Windham. Tickets are: $12 adults, $10 seniors, and $5 students and can be purchased online at www.mwamconcerts.com or by contacting Karen Strange Frager at 207-939-7947. Seating is general admission, and the box office opens at 6 p.m. This concert is part of the Music with a Mission concert series. A portion of the proceeds will support the work of the North Windham Union Church and the Raymond Community Church as they give back and serve their communities.